Whether it’s to fulfill their commitment to a green initiative or just to save money on energy costs. Companies are increasingly looking for eco-friendly options in their operations, and overhead conveyors fit the bill. When you compare overhead conveyor systems to floor-based systems, you start seeing the energy and cost savings right away. Every time a conveyor system is forced to stop and start. It uses far more energy than if it was allowed to continue operating for the same period of time. Considering that at least part of the length of an overhead system runs up over the traffic and potential obstructions that can happen on the floor. They will generally operate without interruption for longer, and reduce the extra costs that stop and starts incur. Compared to floor-based conveyors, overhead systems can reduce energy use in two main ways. First, with the ability to travel over other equipment and objects. An overhead conveyor can take a more direct, shorter route. That means it will use less energy to move items from point A to point B versus a floor-based conveyor. Second, with a built-in ability to handle tight corners, overhead systems don’t need additional power-draining equipment, like turntables, to get your items where they need to go. By opening up unused space overhead for processes like storage and drying time. Overhead conveyors eliminate the need to use valuable floor space for the same functions. You get more done in less space, and you save the costs of heating and air conditioning the extra space you would need otherwise. 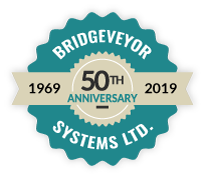 To learn more about how you can save money and energy by installing an overhead conveyor, give us a call here at Bridgeveyor.